Charterhouse is proud to enjoy a close relationship with Green Oak Primary School, situated nearby in the Ockford Ridge area of Godalming. Since September, a group of Charterhouse sixth form pupils have been running clubs at Green Oak, as part of our partnership, and Green Oak’s focus on improving co-curricular activities for children. Every Thursday, fifteen Carthusians (pupils) travel to Green Oak and lead younger children in a range of sporting and creative pursuits. 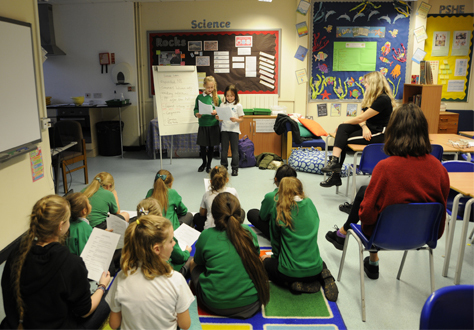 The Charterhouse team is running three clubs: multi-sports and fitness for Key Stage 1 pupils (age 4-7), art and drama for Key Stage 2 (age 7-11), and an Enrichment Society for Year 6 pupils (age 10-11) currently focussed on learning Spanish. Additionally, one Carthusian who loves the outdoors is supporting Green Oak’s Forest School club, which also meets on Thursdays. Within two months of beginning this wonderful partnership project, nearly a third of Green Oak’s pupils have signed up for one of the clubs! Alongside the pupil-led activities, Charterhouse parent Gill Johnson is supporting the school’s wider well-being, leading mindfulness sessions for Green Oak staff. For more information about Charterhouse’s schools partnerships work, please contact Ben Cahill-Nicholls: BCN@charterhouse.org.uk. Visit the Green Oak website at www.greenoakschool.org.uk.